A look at the best Toyota Tacoma accessories to help you get the most from your beloved pickup truck. Every weekend, Toyota Tacoma owners around the globe head out and hit the road less traveled in search of a new adventure. Whether off-roading, watersports, camping, exploring or just taking a nice Sunday drive down a new trail, the Tacoma is a global go-to vehicle for adventurers from all walks of life. Of course, as one of the most customized pickup trucks in the world, the factory is just the beginning for many owners, who customize and tailor their Tacoma to their precise needs and lifestyle with a variety of accessories and add-ons that truly make it their own. Below, we’ll look at a few popular and unique accessories designed to help stir inspiration and help you get the most out of your beloved Tacoma. With excellent owner reviews and a US-patented design, the Tyger Auto Tri-Fold Tonneau Cover provides plenty of confidence for the shopper after a durable, easy-to-use and affordably-priced tonneau cover for their Tacoma. Keep your belongings away from prying eyes while protecting them from the elements via the marine-grade vinyl construction, heavy-duty aluminum frames, and stainless-steel hardware. 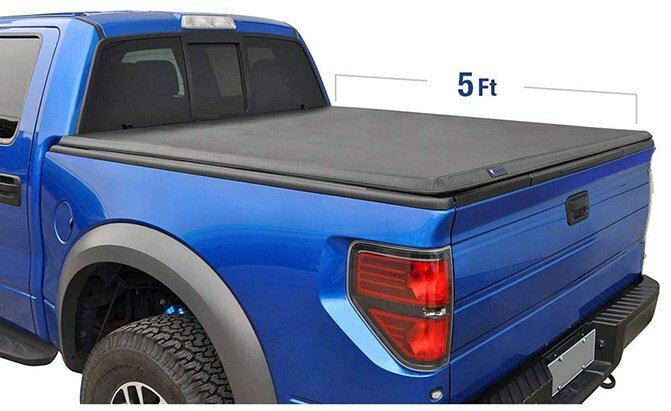 This tonneau cover installs with no drilling or cutting and a limited lifetime warranty backs your purchase for the long haul. The tri-fold design helps ensure easy access to your gear and adds flexibility to accommodate various sizes of cargo and packages. The Tyger Auto Tri-Fold Tonneau Cover has satisfied many owners, with over 90 percent of its owner reviews in the 4 or 5 star range. Most owners report hassle-free installation and use though some complain of low-quality hardware that doesn’t always reflect this product’s price-point. 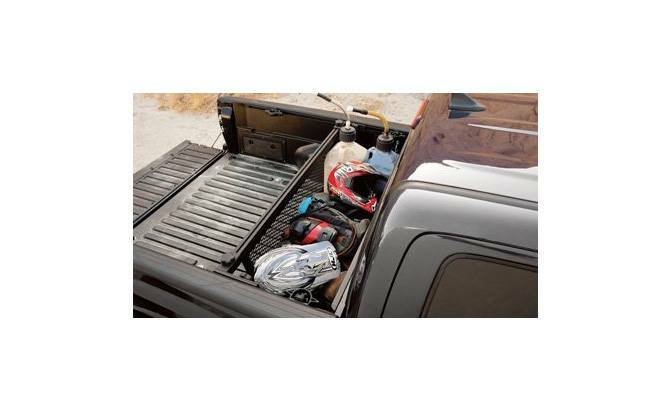 This authentic Toyota Tacoma Cargo Divider makes your truck’s bed more useful, more configurable, and allows for easy customization for tackling virtually any hauling job. 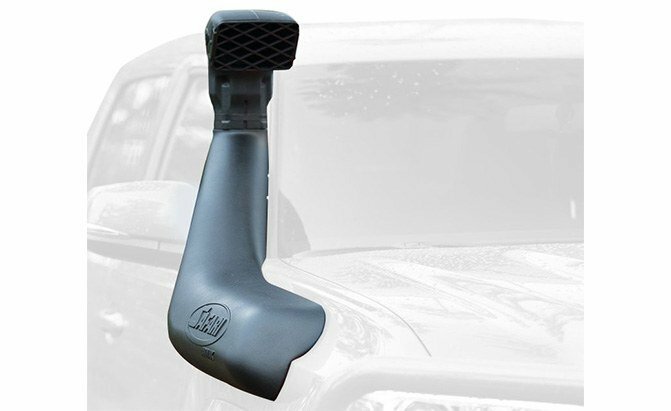 An authentic Toyota accessory, it’s designed built and engineered to last the life of your truck. Corrosion-resistant powder-coated aluminum ensures a long life. Full integration with your Tacoma’s deck-rail system adds ease of use, and the Genuine Toyota Tacoma Cargo Divider is able to help keep loads of up to 400 pounds securely in place—with no slipping, sliding or smashing of your cargo, even on rough terrain. Multi-position use allows for quick adaptation to any gear or cargo, and the Genuine Toyota Tacoma Cargo Divider can even be rotated or laid over top of cargo for added versatility. Use this with a tonneau cover to keep your gear fully secured, protected and stable on any trip. Offering up equal parts interior dress-up and long-term protection, these affordable, form-fitting floor mats from SMARTLINER trap moisture, dirt, mud, salt and other unwanted materials before they can soak into your Tacoma’s carpeting and cause damage, mould, odor, or rust. 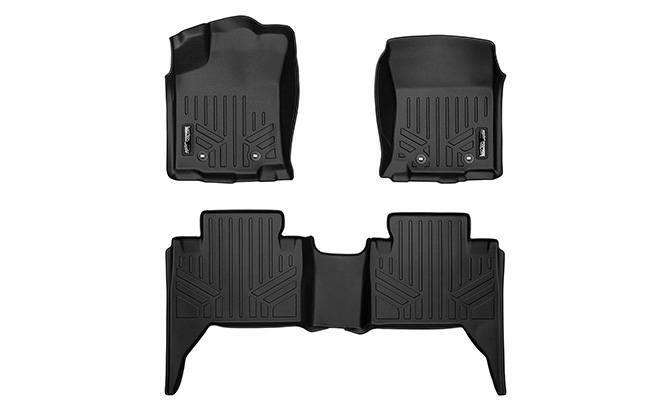 The SMARTLINER 2-Row Floor Mats offer up protection for each seating position, and their textured and skid-resistant material is easily cleaned with a damp rag, garden hose, or pressure washer. A lifetime warranty is included for maximum peace of mind. With an elevated lip edge and contour-hugging design, spill-over of trapped liquids and dirt is all but eliminated. The outer lip is even reinforced so it won’t be crushed by occupant footwear on entry and exit, possibly causing a leak. Owner reviews are overwhelmingly positive, with most owners reporting perfect fitment and performance at an appealing price. A few owners have reported improper fitment, so assess the mats when they arrive and save the packaging material in case a return is needed. Just note that the SMARTLINER 2-Row Floor Mats are not compatible with Tacoma trucks with the manual transmission. 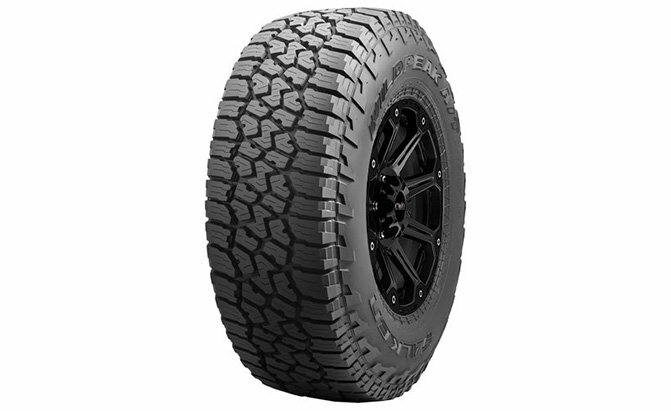 This affordable, effective and feature-rich All Terrain Radial Tire from Falken is a fan-favorite with 4×4 owners and off-road enthusiasts around the globe, primarily for its combination of reasonable pricing and excellent performance. Designed for use in any weather and on any terrain, these well-reviewed tires include special implements like heat diffuser technology and a reinforced sidewall to help enhance stability and durability for the long haul. An aggressive upper sidewall and offset shoulder blocks help add additional traction, while protecting against cuts, bruises, and punctures, and full-depth sipes and grooves are used to enable consistent performance throughout the tire’s entire service life. Finally, with the Three Peak Mountain Snow Flake rating, the Falken Wildpeak ATW All Terrain Radial makes a solid choice for the pickup driver who chooses to run one tire all year round—even in winter climates. This is a well-rated and high-performing tire at a highly reasonable price, and it comes backed with 100 percent of its owner reviews in the 4 or 5-Star range. Owners say the noise levels are surprisingly low, though some have had trouble balancing the tires. 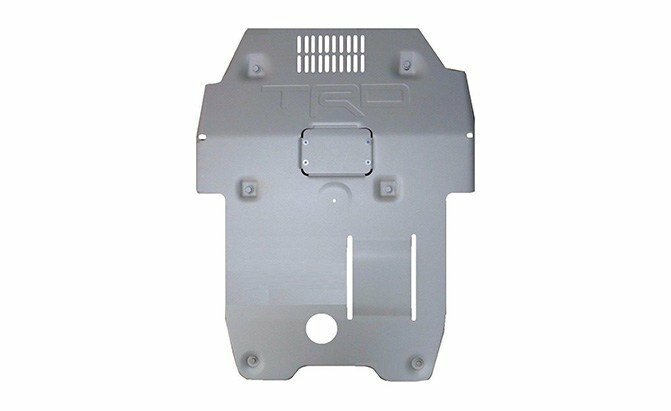 Treat yourself to a taste of the TRD accessories line with this popular off-road skid plate. Designed and built specifically for your Tacoma by Toyota experts, the Toyota TRD Pro Front Skid Plate is made to last the life of your vehicle, while adding protection and confidence for serious off-road use. Genuine OEM quality materials and precise fitment ensure maximum protection for your Tacoma’s vital organs. With stamped and formed quarter-inch aluminum, this skid plate is big on durability and won’t corrode like lesser steel skid plate assemblies. A powder-coat finish adds further toughness and a nicely finished look. Best of all, unlike lesser knock-off skid plates, the Toyota TRD Pro Front Skid Plate won’t block or interfere with the operation of your Tacoma’s cooling system, and it features special openings for easy access to all maintenance points and vehicle tow hooks—meaning you needn’t remove it for basic maintenance. Installation requires no drilling or cutting, but the Toyota TRD Pro Front Skid Plate only fits Tacoma trucks with the off-road or TRD Pro packages. 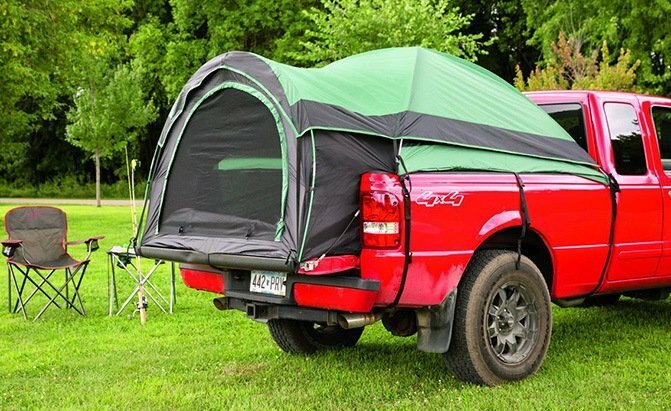 This affordable, well-reviewed and immensely handy truck tent from Guide Gear might be the ultimate accessory for the Tacoma driver who regularly partakes in camping adventures. 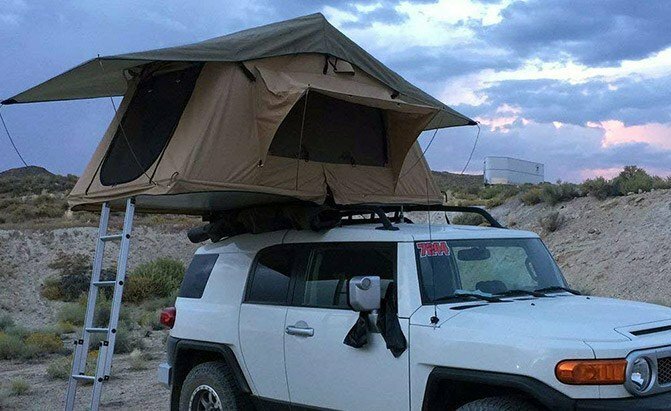 The Guide Gear Compact Truck Tent stores in a small and compact bag, but erects in minutes to turn the bed of your Tacoma into camping tent that’s fully sheltered and provides a comfortable, elevated sleeping space that’s high above the ground. Excellent ventilation and top-notch materials are on offer, and a total of just 4 poles makes setup a cinch. A large D-Shaped door opens at the rear of the truck bed for easy access, and tensioning straps keep the cover taut so water and snow fall right off. Expect to be dry and comfortable, even in bad weather. A rain-fly is included. For $70, the Guide Gear Compact Truck Tent makes an excellent investment for the avid or aspiring camper. Though owner reviews are generally positive, some have complained of low-quality materials, broken poles, and poor ventilation. The Tyger Auto Front Bumper Guard is an affordable way to add styling flair, protection, and customizability to your Tacoma. With a US-patented design and heavy-duty construction, this bumper guard is built to last—and it includes a light mount channel that makes it easy to install additional lighting provisions to taste. 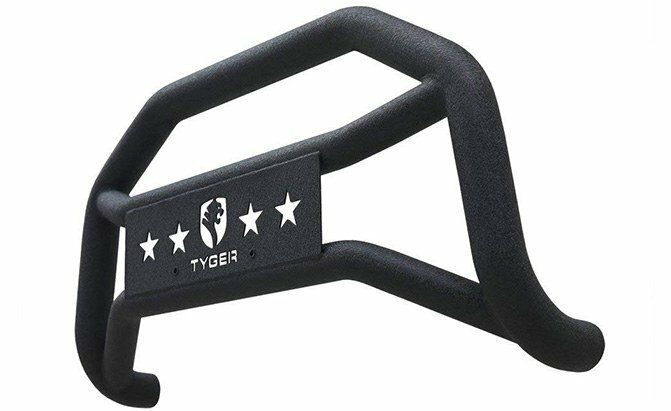 The Tyger Auto Front Bumper Guard fits most models without any cutting or drilling, though installation may require removal of the front skid plate or slight cutting, on some newer trucks. The 2.5-inch tube frame and textured E-coating add a customized look and long-term rust protection. A 5-year warranty against defects is included as well. Here’s a well-built and full-functioned bumper guard that’s backed well, and priced affordably. Owner reviews are generally positive, and report satisfaction with the unique looks and easy installation. Some owners have reported early rust though, so keep your warranty card handy. 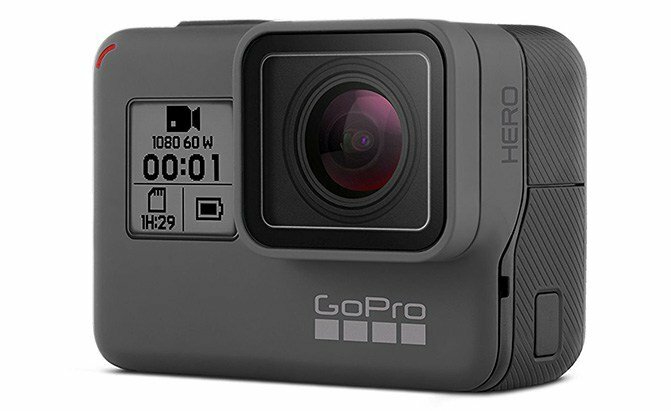 GoPro action cameras are small, highly portable, rugged, durable, and amazingly useful at capturing your adventures, travels and experiences with high-quality video and photo recording. A solid GoPro action camera kit includes a spare battery, charging cord, and at least one suction mount, which allows users to stick the camera to virtually any flat surface inside or outside of their ride. Just stick it on and press record: though the GoPro can be customized, out-of-the-box operation ensures access to high-quality recording with a single click. Consider the Gopro HERO camera: it offers HD video capture, 10MP photography, and a slew of other advanced functionalities including voice control, time-lapse mode, night-mode, and full Smartphone compatibility for easy sharing and remote control of the camera. A built-in touch-screen provides easy access to all functions, and since this camera is fully waterproof and weather-sealed, it can safely be used in sand, mud, water, dirt, and more. Many of your Tacoma-driving friends use a GoPro camera with some handy accessories to record and share their adventures. With affordable pricing and immense portability, so can you! For serious adventuring on the road less travelled, it’s important to ensure your Tacoma is equipped to tackle anything that gets in its way, including streams and rivers. That’s just why the ARB Safari Snorkel Intake Kit is such a popular add-on with so many drivers. By rerouting your factory air intake location from under the hood to up near the top of the windshield, the ARB Safari Snorkel Intake Kit adds confidence to spare when a water crossing comes between you and your destination. Though most trucks can handle crossing some depth of water, accidental ingestion of water via the air intake system can stop your engine dead in its tracks and cause fatal damage in the process. That’s just why the ARB Safari Snorkel Intake Kit exists—and it amounts to a must-have for serious off-road enthusiasts around the globe. This is a premium product and comes priced accordingly, but quality engineering, design, and materials are worth it for many. A built-in water separator keeps your intake air dry when driving in the rain while maintaining air flow and performance superior to low-price, knock-off options. Just note that installation requires cutting of your truck’s fender, which can compromise its corrosion resistance and durability. 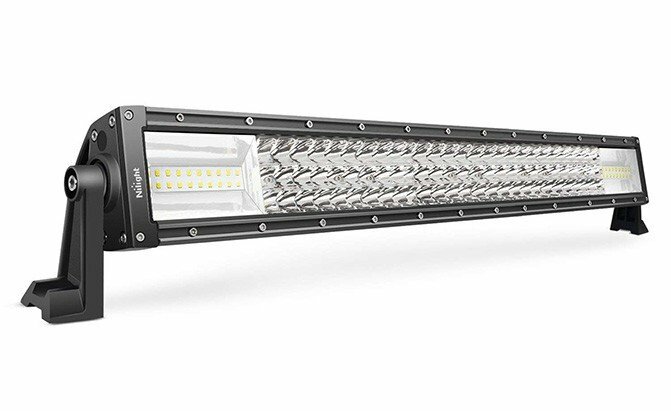 With a well-reviewed combination of affordability, performance and style, the Nilight Triple-Row Light Bar is available in several sizes and configurations that allow it to match up easily with any shopper’s tastes or budget. Packing three rows of powerful LED lights and a nest reflector, extreme performance and highly efficient illumination are on offer. Special provisions in the mounting hardware keep the light stable and level with no need to readjust its positioning, even after a rough off-road drive. The waterproof die-cast aluminum body features built-in fins for efficient cooling, which works with an anti-scratch lens coating for a long and trouble-free life of consistent performance. Installation options are numerous. Many owners rate the Nilight Triple-Row Light Bar highly, citing strong performance and low pricing as key reasons for their satisfaction. Just ensure that the use of this product doesn’t break any local laws, and be sure to determine where, and how, you’ll mount the product before you buy. Some shoppers have reported units that were dead on arrival, or packaged with broken, missing or damaged hardware. Watch the Warranty: Though many accessories, add-ons and customizations are no cause for alarm, some have the potential to negatively impact the durability and performance of your Tacoma, and may void remaining factory warranty coverage. Do your research first—and check your owner’s manual (or with a local dealer) before installing any accessory that modifies or replaces any part of the truck. For instance, some accessories may require drilling or cutting into factory bodywork, which can void your factory corrosion warranty. 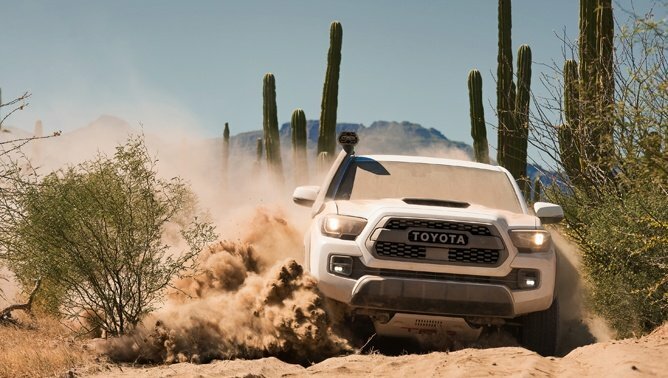 Other accessories may modify the Tacoma’s suspension, engine, or on-board electronics, possibly causing problems and likely voiding warranty coverage. Remember that virtually no automaker provides warranty coverage on damage caused by the failure or improper operation of a non-factory part, so proceed with caution before installing any upgrade that requires the replacement or modification of a factory component. Suspension lift kits, non-factory electronics, engine parts, and engine management software should all be selected with extreme caution. Factory Accessories Where Possible: Whether you buy from a dealer or an online retailer, remember that factory-approved accessories are well worth your consideration for a variety of reasons. First, these tend to be engineered, designed and constructed to meet the same high standards of quality and durability built into the rest of the vehicle. Translation? Factory accessories tend to last longer, perform better for the long haul, and cause fewer headaches. Further, as factory accessories are designed in conjunction with the same people who design and build the vehicle they’re fitted to, they tend to fit properly the first time and every time. If you have a problem, factory accessories are typically covered by the new-car warranty and easy to return to a dealer with no shipping fees. Consider Professional Installation: Though many Tacoma accessories can be installed with relative ease, professional installation may be ideal for a cleaner, more worry-free install. Proper installation can also help many accessories (and the truck itself) last longer and perform better, too. Professional installation is especially worth considering for accessories that require modification of the Tacoma’s wiring, suspension and steering, body, and driveline. Unintended Consequences: Suspension lift kits might make your axle seals leak. 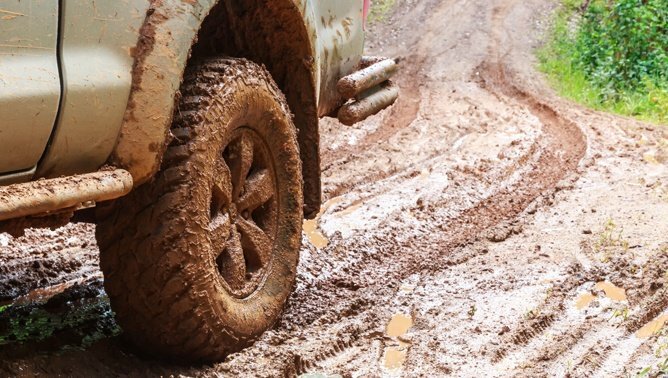 Upgraded off-road tires could ruin your fuel economy. Splicing into your factory wiring harness to power an aftermarket light-bar could fry your Tacoma’s on-board computers. Retailers don’t typically tell you about the possible downsides of using their products, which is why it’s so important to do your homework first. Read those owner reviews, talk to other owners, or ask a professional for help and advice before you buy. Ask Your Friends: Trying to get ideas? Stuck deciding between two similar accessories? Not sure whether or not you should go with professional installation? Be sure to ask your Tacoma-driving friends. Using Facebook or the internet, you’ll quickly be able to find numerous online communities full of like-minded Tacoma drivers who are happy to share their experiences, ideas and setups. With little effort, you’ll find plenty of inspiration, how-to guides, product reviews and more—all from people driving and enjoying the exact same truck as you. Maintenance is Key: Regardless of the accessories you choose to enhance your Tacoma for use in an off-road setting, remember that your truck is still a machine made of parts and components that require occasional servicing, inspection, and maintenance to ensure a long life. If you’ll kit your Tacoma up for more frequent off-road adventures in dusty, sandy, muddy or wet conditions, be sure to ramp up your maintenance schedule accordingly—shortening the intervals to replace fluids, filters, and have regular inspections performed by a technician. Off-road accessories make your Tacoma tougher, stronger and more capable, but it’s still strict adherence to regular maintenance and care that ultimately defines how long your truck will last. Spend It: Not all accessories are created equal, and many owners have learned the hard way that you can typically buy the cheap stuff over and over again, or the pricier stuff just once. When considering any accessory or upgrade for your Tacoma, shop products from brands familiar to you (or the Tacoma owner’s community) and avoid deals that seem too good to be true, as they usually are. Many online retailers also provide a list of owner reviews, which are useful to help guide shoppers to the right products—and to help them avoid the wrong ones. To avoid warranty repairs, return shipping, and general hassle, you’re typically best to spend a few more bucks on a comparable product from a higher-end brand, than to go with the cheapest option. Remember: the Tacoma is a highly-capable vehicle that you’ll likely subject to some severe conditions—and you’ll want to make sure any accessories you install are also up to handling the job. Avoid Power Programmers: The automotive aftermarket is brimming with Power Programmers (also known as ‘chips’ or ‘tunes’) that promise to increase power and performance by simply plugging in a small electronic device to your vehicle’s computer brain. For the majority of shoppers, these accessories are best avoided, as they can cause issues and headaches, and even damage your engine. It’s important to note, as well, that the use of this type of accessory, which literally modifies the factory programming of your vehicle’s powertrain, will almost certainly void any remaining powertrain warranty once used, and that’s even if it’s removed prior to a dealership visit for a warranty-related repair. Do NOT underestimate how effective dealer service departments are in detecting the current (or former) installation of this type of warranty-voiding modification to deny warranty claims.